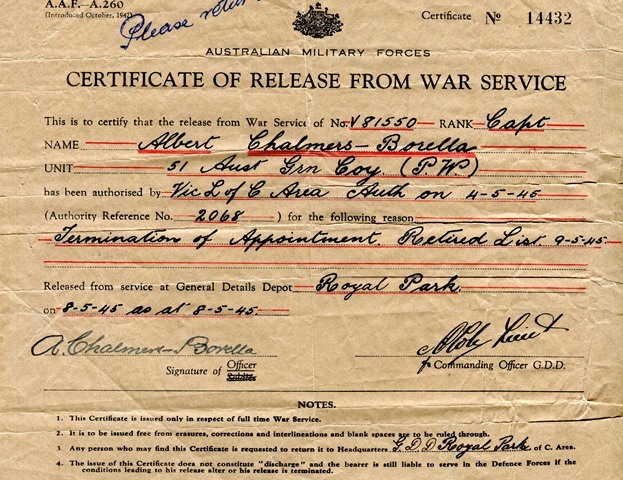 With the war in Europe over, Borella’s service in charge of internees and Prisoners of War was nearing its end. He was 64 – considerably older than most soldiers. The German surrender was given to the Western Allies (including Britain and the USA) on May 8th and to Russia on May 9th. In the East, the war ended when Japan surrendered unconditionally on August 14th, signing their surrender on September 2nd. After the war, Borella became an officer of the Commonwealth Department of Supply and Shipping as an Inspector of Dangerous Cargoes. He retired in 1956, and went to live in North Albury, NSW.